Irish Gifts - I see green people pillow with shamrocks. 100% Cotton Backing, 39% Polyester, 51% Cotton, Covering and 100% Polyester Filling. 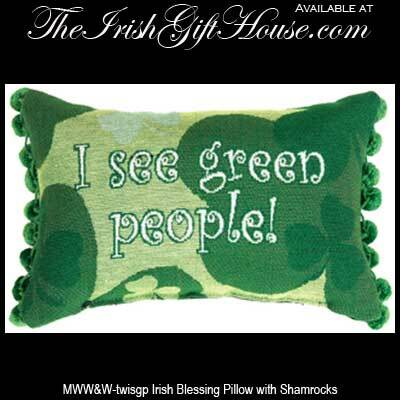 Irish Gifts - I see green people - Irish Blessing Pillow with Shamrocks. 12.5” Long x 8.5” Tall with Tassel Ball Fringe.